The Secret Hotels App was developed during a corporate hackathon in July at parent company, Wotif Group, and stemmed from a partnership between lead mobile team developer, Richard Sbresny, and a designer from the user experience team. Under the conditions of the activity, which was overseen by Wotif Group’s IT division, 17 teams were given 12 hours to come up with a working prototype of a new customer-oriented, technology-driven offer. The activity was aimed at bringing together teams from across the business to innovate and find new ways of providing value to customers and involved 100 staff. The best offering would then be taken to market. Secret Hotels was an existing section within the lastminute.com.au website but had not previously been marketed as a standalone brand. It gives Australian hotel brands the ability to promote last-minute rooms to what Wotif Group claims is a growing market of spontaneous travellers. Customers can book a Secret Hotel up to 72 hours before check-in at rates of up to 40 per cent off. The new iOS app is designed as a native app, making it highly responsive as well as giving consumers the ability to complete a booking even if they have a connection drop-out, Sbresny explained. 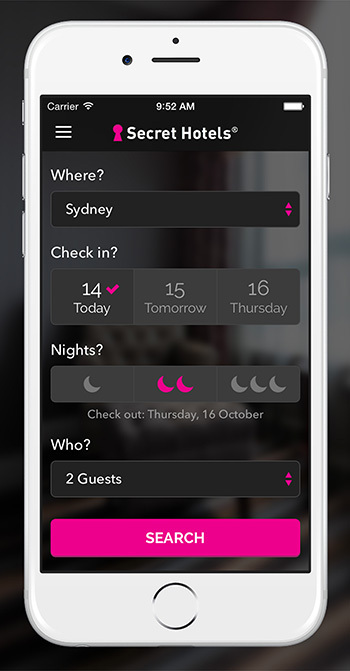 Once a consumer types in the date and location they’re after, the app shows six hotels across a number of Australian cities including one ‘secret’ hotel. Customers can either choose one of the five nominated hotels or the sixth unknown, which is guaranteed to be one of the five listed on-screen at the lowest price available. All locations are displayed on a map so users can identify the rough location of each property in a city. Thanks to input from other teams including product, the app development team quickly decided to offer five hotels, instead of three, as a way of reducing the risk for consumers while still providing sufficient exposure to its hotel partners, Sbresny said. Sbresny said the app has chalked up the fastest turnaround to date for a project of its size and scope. He added developing the app was a highly collaborative process involving staff from mobile development, marketing, user experience, plus other teams within the organisation. As part of the development process, the team also built-in customer feedback capabilities and will make changes to the app based on these. “We’ve also put metrics in place so we can understand how our customers are using the app,” Sbresny said. Anonymised data being tracked includes time spent in the app, popular locations and hotels, lead features and what percentage of users opt for secret hotels versus named properties. Already, the team has learnt Wednesdays are a popular booking day because Friday appears in the booking window, Sbernsy said. There are no current plans to expand the app to Android devices, but that could change depending on the success of the app, he added. As a result of the success of the hackathon, Wotif Group is now looking to again run a similar internal activity in the New Year. The digital travel services provider is one of a number of organisations embracing hackathons and rapid-first IT projects as a way of driving innovation in products and services. In some cases, these are internal-only initiatives; others, such as Sydney Opera House’s hackathon last November to create an app for the venue, are open to external developers and include cash prizes. At a larger scale, snacking brand, Mondelez International’s Mobile Futures program is about uniting core brands with startups to develop new mobile marketing opportunities for the business.